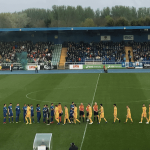 Waterford FC fell to a 3-0 defeat against a clinical Cork City at Turner’s Cross on Friday night despite a positive performance that they’ll look to carry into next Friday against St Patrick’s Athletic. The Blues controlled much of the first half but a suckerpunch in stoppage time from Garry Buckley gave them the lead, before further goals from Graham Cummins and Kieran Sadlier in the final quarter as the Blues chased a leveller. The Blues, who made one change from Friday’s 4-0 win against Derry City, started well and created a number of good early chances. 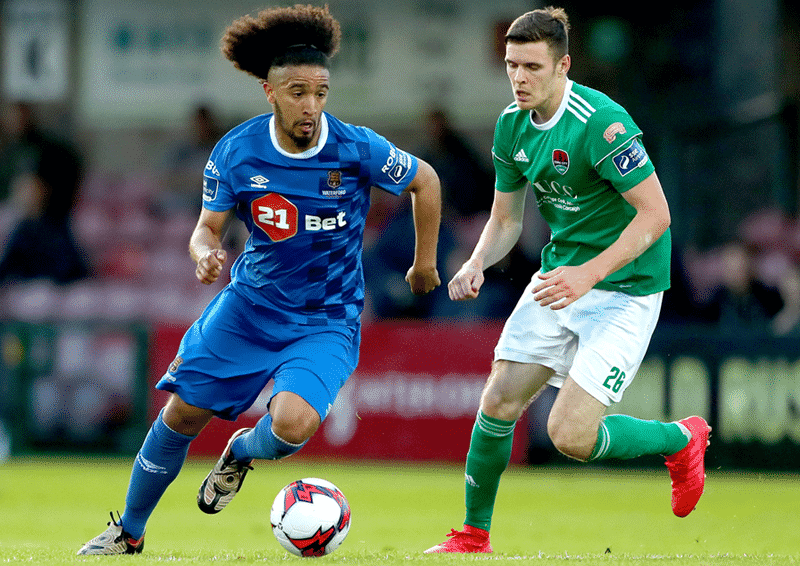 There was just six minutes on the clock when Bastien Hery fed Izzy Akinade through the centre but Cork City keeper Mark McNulty was quick to smother; Courtney Duffus couldn’t get space for the follow up. Three minutes later Akinade was again involved. Gavan Holohan found the striker who controlled well but couldn’t find a way past McNulty. Cork came into the game and had a chance of their own but Blues keeper Lawrence Vigouroux easily tipped the long-range effort from Shane Griffin over the crossbar. Five minutes later City should have taken the lead. Colm Horgan crossed from the right for former Blues striker Graham Cummins but he fired wide of the front post despite his closest marker Kenny Browne losing his footing. The Blues looked to take back the momentum as Faysel Kasmi swung in the corner from the right but David Webster couldn’t get enough contact as the ball flew past him in the packed penalty area. City stormed back on the attack and struck the woodwork. Garry Buckley found Barry McNamee and he fired off the post, before Cummins headed straight at Vigouroux from the resulting chance. Cork had appeals for a penalty two minutes before half time when Kieran Sadlier went down as Lawrence Vigouroux looked to collect; referee Robert Harvey waved play on. And Cork took the lead against the run of play in the second minute of stoppage time. 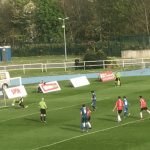 David Webster fouled Garry Buckley on the half-way line; the resulting free kick from McNamee dropped to Buckley and his deflected strike flew beyond Vigouroux. The Blues started the second half well and Courtney Duffus saw his snapshot saved by McNulty and collected at the second attempt. Gavan Holohan then saw an effort drift wide before John Martin forced McNulty into a good save. Rory Feely did well down the right to find Martin, but the Cork keeper was down quick to make the save. Faysel Kasmi’s free kick failed to find a Blues player as McNulty collected with ease, before Cork doubled their lead as the game entered the final quarter hour. Karl Sheppard crossed for Graham Cummins and he headed beyond Vigouroux. And as the Blues pressed to get back into the game, City took advantage. Beattie crossed for Cummins to put the ball on a plate for Kieran Sadlier to fire home to make it 3-0. Waterford FC: Lawrence Vigouroux; Rory Feely, Kenny Browne, David Webster, Dylan Barnett; Bastien Hery, Faysel Kasmi (Dean Walsh 78), Gavan Holohan, John Martin; Courtney Duffus, Ismahil Akinade.